Avast Browser Cleanup helps you remove annoying toolbars, browser hijacker and redirect from popular Internet browsers like Internet Explorer and Google Chrome.Its powerful mechanism is effective to uninstall adware component completely from the affected computer. In times that you are unsure whether or not to remove the add-on, Avast has a function to just disable it. Disable just switches the functionality of the add-on and you can enable it when necessary. These days, freeware or shareware are flooding the web. Computer users preferred this type of distribution because it is cost-less and there are wide varieties of programs to download. Without their knowledge, it comes with unwanted code which normally affects internet browsers. This is called adware, the main income-generating method for the developer. Adware intends to exhibit ads whenever you surf the web. It could also redirect search page to unwanted one. Moreover, adware are known to integrate a toolbar into the browser that similarly earns profit by endorsing products and services. Avast Browser Cleanup helps you find these adware even if they are placed deep into the system. This tool can automatically remove what it sense as ‘bad’ add-on or extension. 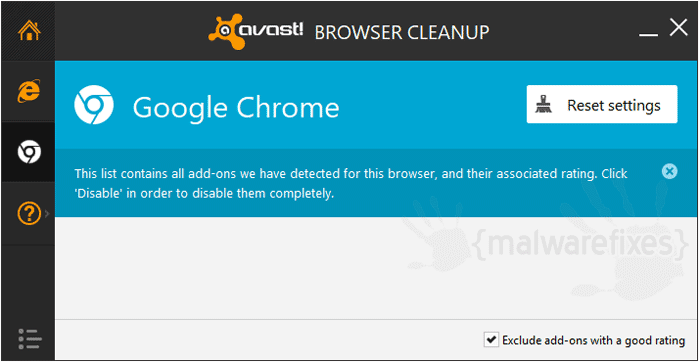 For suspicious entries, Avast Browser Cleanup gives you an option whether to remove or disable them. 1. Get the tool from the link provided below. 2. Double-click on the downloaded file to execute the program. It immediately scans the computer for presence of adware and other unwanted add-on or extension. Remove identified items and restart the browser. Kurt, link is fixed already. Thanks for bringing that issue to our attention. I find the same as Kurt did. Why does Avast software force me into choosing only Yahoo or Bing as my default search and doesn’t offer others such as Google as an option? I don’t necessarily want Google, but when it freeware gives me only those two options and also asks me to agree to their terms and conditions, it was cause for concern for me. So I decided to delete their program rather than using it. Thank you! After 2 full days of trying to clean up a machine using Kaspersky Pure 3.0 and Malwarebytes Premium Anti-malware, this prog did the necessary cleanup without a hitch, and gave me a clean slate in no time flat! I have no trouble with accepting the defaults as that what you get on a clean install of Windoze (Windows). I’m not saying the aforementioned progs didn’t do a fine job of detection, but they aren’t the best at cleaning up the mess afterwards. I was having real problems with go.goadvs. I did multiple scans with Trend, etc, tried Malwarebytes free trial (limited so I expected little!) but no one was catching the virus. Avast took care of it in an instant. Installed Avast Browser Clean up on a friend’s recommendation. It did the job of removing an extension called ‘Furniture Guru’ in Chrome, but when i open Chrome browser again, that extension re-attaches itself. It reads as, “This extension is managed and cannot be removed or disabled.” it can’t be deleted/disabled, it reads, “installed by enterprise policy”. Is there any way by which i can remove this add-on? Patz, try the Google Chrome reset tool. Just search the web for Chrome Cleanup Tool. Just downloaded the Adwcleaner; it found the files and I deleted them. Upon reboot, I opened the Task Manager and “noadVarianceTV – Internet Explorer…” once again open and activated, AGAIN. ANY suggestions??? I kept doing full system scans with Avast!, and it kept detecting files with gibberish names (hurutxrwucjh for example), as well as inter_silent_v400.exe. After installing Avast! Browser Cleanup, it immediately detected Istartsurf and took care of it with ease. Thank you so much for this. I installed it, but it didn’t detect that I had Firefox installed and that’s the browser with the issue!